If you’re a Pinoy beginner who wants to invest in mutual funds in the Philippines, this tutorial will help you do like that. Investing in Philippine mutual funds has never been this easy with the advent of online platforms which allows you to invest in mutual funds directly right on your computer or mobile phone screen. Unlike before where you’d normally go through an individual agent to buy mutual funds, two of the most popular online stock brokerage companies in the Philippines are now offering mutual fund investments too together with their primary stock brokerage business. These two online Philippine brokers are COL Financial’s Fund Source and First Metro Securities’ FundSmart. A Philippine mutual fund is an investment company registered with the Securities and Exchange Commission (SEC), which pools money from many investors allowing them to create a bigger fund under a common objective agreed by the investors. This fund is then invested in specific types of securities to achieve its stated objective. Economy of size makes this pooled fund as a whole “more powerful” than the initially isolated individual funds in achieving a common goal understanding the risks involved. Money Market Funds invest purely in short-term debt instruments (one year or less). Bond Funds invest in “bonds” which are really long-term debt instruments offered by governments or corporations. Balanced Funds invest in a mix of shares of stock and bonds. Stock / Equity Funds invest primarily in shares of stock. Investing in a Mutual Fund (under Balanced or Equity types) therefore is an easy alternative way to invest in the Philippine stock market which requires a lot less time and monitoring on your part. Little time because you just basically “give your money” as your investment and let the fund manager do the job of judging where to invest it and the needed subsequent monitoring. Compare this with direct stocks investing where you yourself does all the analysis (stocks selection) and trades (buy and sell) needed, something that would obviously demand more time from you. 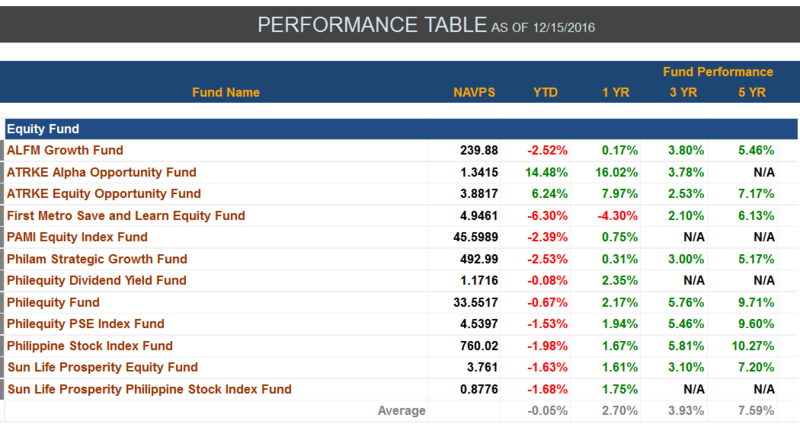 Another good thing about Philippine mutual funds is you can start investing in it with as low as Php 5,000 only. There’s no required regular addition (or top-ups) but I’d personally recommend that you add regularly and really use it as your giant piggy bank for your long-term goals (at least five years). Another advantage of mutual fund over direct stock investing is the diversification it offers. If you’re buying stocks on your own, your 5k initial capital can only buy at most two stocks. But when you buy a mutual fund, you’re actually effectively buying a basket of stocks and other securities like government/corporate bonds. Diversification is one common investment strategy in managing the risk for any investment. One downside of mutual fund over stocks are the additional fees involved in mutual fund investing, such as management and front-end fees. Look at these costs as your “payment” for joining in the mutual fund and riding on the expertise of its fund managers. The good thing about online mutual fund sellers is they are waiving (as of now) the normally charged front-end fees which means savings for you. There’s also typically a minimum holding period for your Philippine mutual fund investment, some with as short as 90-days. You can always cash out your investment earlier than this but you’ll be charged an early redemption fee. Other details about the mutual fund, such as its performance and portfolio mix can be easily found as part of the resources page of your online broker, like shown below. In terms of potential returns, mutual fund is ideal to be part of your mid- to long-term portfolio, typically with at least five years time horizon. You can see below a representative historical performance of equity type mutual funds in different holding periods, 1 YR, 3 YR and 5 YR, as of December 15 2016. It’s important to note though that just like in stocks investing, the returns of mutual funds are never guaranteed as this heavily depends on current market conditions. As I mentioned, you can buy mutual funds yourself via online brokers COL Financial and First Metro Securities. COL Financial offers mutual fund through its online platform COL Fund Source. This platform becomes available to you right after opening an account with them. You can choose from 20+ of mutual funds offered by the top 6 mutual fund companies in the Philippines and buy(invest in) them with ZERO front-end fees. If you already have a COL Financial account, you can readily buy your first mutual fund. To explore and start using COL Fund Source, log in to your COL Financial Account and just click on the Mutual Funds tab. You can also watch below video tutorial how to buy/sell mutual fund shares in Philippines with COL Financial Fund Source. Another online broker offering mutual fund is First Metro Securities under the Metrobank Group. It’s practically the same as COL Fund Source, offering mutual funds from top six mutual fund houses and also has no front-end sales charges. If you already have an account in trading broker First Metro Securities, then you can also consider buying mutual funds online as part of your diversification. UPDATE: Below is its performance as of September 19 2017 (after less than five months). UPDATE: Below is its performance as of October 19 2017 (after less than six months). This day, I also redeemed my investments (converted to cash). That is, my money has earned around 10% profit after less than six months (not bad!). As a final note, while mutual fund is an excellent choice for passive investors who simply want to have greater returns than what banks can offer, it’s important to remember the importance of goal setting and risk assessment in every investment you’ll take. Fortunately, and in line with government regulations, online brokers offering mutual funds normally have its risk assessment questionnaire that will help you decide which type of mutual fund is best for you based on your answers to the questions. Additionally, before you invest, ask yourself the purpose of each of your investment. This way, it will be easier for you to manage your investment (and your emotions) knowing its original intended purpose. Many newbies fall to the trap of losing this mindset when they start seeing losses even if it’s not yet done within their investing time frame. As with stocks, you’d need to allow your mutual investments to grow over time to achieve optimal returns for your goals. Hope this helped you in your search of where to invest your hard-earned money. If you’ve got more questions, you can send them to me through my contact page. Hi sir omeng, pano at san ma do-download ang col fi ancial app? Para sa mobile? Am interested po? Hi Miko, i don’t think COL Financial has its mobile app available. Other brokers like 2TradeAsia have their mobile platform but not COL Financial yet. hello po, is it worth it po ba na magload para sa mutual fund? How many hours per day I will going to spend doing this? HI Sir Omeng, kung mag iinvest po ako sa mutual fund anong companies ang nag bibigay nag dividend? Hello sir. Tanong ko lang po, meron din po ba fund manager pag sa col financing ako mag open? COL Financial has both stock market and mutual fund. If you will invest in Mutual Fund, then a fund manager will handle your investment. If you go directly buy stocks, then you will have to do it yourself, no fund manager who will manage it for you. Hello, can you please advise what kind of Mutual Fund suits my retirement plan? Thanks. hello, this is a rather tricky question since this depends on market conditions among others. In general f you have time projection of at least 7-10 years, then equity type can be a good option. How to invest po using equity/stock investment? You can choose to buy index-type mutual fund. Hi, when you say “redeemed”, does that mean you sold your stocks? Thank you. yes, to redeem means to sell your existing mutual fund shares. I found your page very helpful especially to for us, who have no idea about stocks at all. I’m interested in stocks investing but not sure which one will apply to me as a newbie. There’s EIP, mutual funds, buy and sell of stocks, etc. Could you please advise which one should i start with as a newbie? Many thanks for extending help by sharing your knowledge and opening doors of possibilities through your blog. Hi Sherryl, mutual funds would generally be the best place to begin, as you learn the ropes of self-directed investing through time while being exposed to the market through mutual fund investing. Many thanks for your prompt reply and helpful tips, greatly appreciated. I’ll try to attend the free seminar in COL regarding mutual funds. May God bless you in all your endeavors in life. Hi sir. I am a muslim and already started my stocks with Shari’ah approved ones (Halal companies). May i ask if there is specific mutual fund company that caters with halal stocks? Hi Jennifer, mutual funds generally has a basket of stocks, plus its composition changes constantly with time, so I guess it’s difficult to ensure that requirement in a mutual fund in the Philippines for now.